Why are you here this morning? Why did you come to church this morning? Every Sunday morning people come here with a variety of needs and for a variety of reasons. For some it is a habit, developed over a lifetime of attendance. Some people are here because someone else dragged them. Some people are here because their friends are here. Some people just want a weekly spiritual pick-me-up, and see this as the best place to get it. Some people are dealing with heavy issues in their lives, and they want to include God in their decision-making process. And some people are here because they are they are smack dab in the middle of a storm. They feel like they are on dangerous seas, in a small boat, and the wind is howling, the rain is beating down, and it looks like the boat may be going down. There are a variety of reasons why we come on Sunday morning, and for most people, it is not just one reason. But if you find yourself here this morning, because you are in that boat on the stormy sea, or have ever been in that boat, the window we are looking at for today’s sermon is the window for you. Now I always thought this was a pretty silly move on Peter’s part. If it were not Jesus, but a mischievous ghost, he would surely tell Peter to get out of the boat, just to see him sink! But Peter gets out of the boat, and sure enough, it is Jesus and Peter is walking on the water! But then something happens. Peter gets afraid and he starts to sink. When Peter starts to sink, it is not because he just noticed he had nothing under his feet but wet. You make think this is like of like when the coyote runs off the cliff, and is still treading air until he notices there is nothing under his feet, and then he drops. But no. Peter KNOWS he is just on water, and he can trust Jesus to keep him above the surface. What he notices is the wind. It was one thing for Jesus to call Peter out of the boat to walk on the water. But it was quite another to protect Peter from the winds while he was walking on the water. 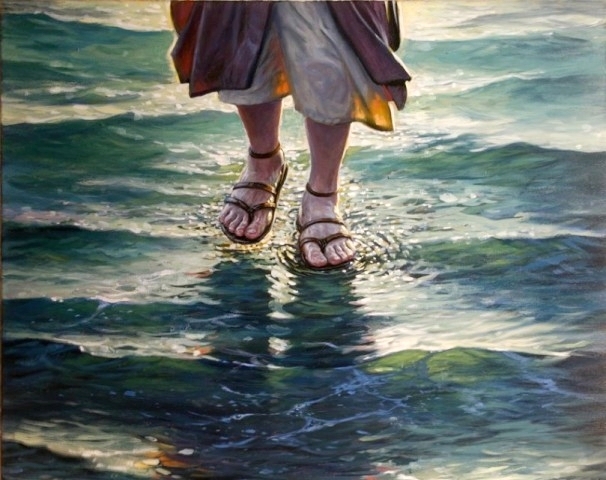 How many of us believe that Jesus could walk on water? Peter did, enough so that he stepped out of the boat. He walked on the water with Jesus. But he was afraid of the wind. Now the wind is inconsequential. The wind on the sea of Galilee can up very suddenly and can capsize a small boat before you know what has happened. The wind was pretty scary. Under any other situation, Peter would have been very smart to fear the wind. But today he is hanging with Jesus, just taking a stroll across the lake. Today is NOT just any day. But Peter is afraid. And I can understand that. It is easy sometimes to think that God can do miracles like walk on water. It is harder to believe that God can reach into our lives and take care of the winds that threaten to undo us. But that is what God does. The rains are threatening to come down, and they will drown out the world, but God gives Noah an ark, to take him through the waters. The children of Israel are standing on the banks of the Red Sea. Across the waters they can see freedom, but coming up fast behind them is Pharaoh’s army and slavery, or death. But God takes them through the waters, and brings them to freedom. Naaman was struck by leprosy. He was the leader of a battalion, but that did not protect him from the disease. But God led him to the waters of the Jordon River, and when he washed in the river, he was healed. Jesus told a story of two men, and each built a house. One built his house on sandy soil, the other on a rock. The storms came. They always do, you know. Life is never without storms. Sometimes, many times, life can be peaceful. The winds of adversity do not always blow. Sometimes everything goes just like we planned it, just like we want it, but not always and when the winds go blow, who do we trust? Peter trusted Jesus enough to get out of a boat and take a stroll on the water, but he had a time believing that Jesus could protect him from the gusts and squalls around him. The wind will blow through our lives. When they do blow, where do we turn? Where do we go? Do we really believe that Jesus can hold our hands through the storms? How do we cope? The first lesson we get I think is from the size of this particular window. It’s a little different from the other windows. First, it is a fairly small picture, in a very large window. This could be a very dramatic window, but it’s not. It’s actually a bit underwhelming. The picture in the window almost gets lost in the window. Now I do not know for certain why this is the case. It could be that they just started to run short of funds for the windows, so they cut some corners. It could be that they ran out of materials. But I like to think the real reason was something like this; Yes we do have storms in life, and we need something in our sanctuary to remind us of that. Our sanctuary should be an accurate mirror of real life. But we only want to acknowledge the storms. We don’t want to glorify them. We want to keep them in perspective. We are not defined by the storms. We are defined by our response to them. We are not defined by the wind and rain that blows into our lives. We are defined by how we meet them. So I like to think that the reason this window is not overpowering because in here, the wind and rain is not an overpowering force. In here we recognize that wind and rain does exist, but we do not bow down to them. We do not let them form our lives. We do not even fear them. Instead we take Jesus’ hand and walk with him. We do the Jesus Walk. Peter saw the wind and he faltered, but he reached out for the hand of Jesus, so he could walk with Jesus. I usually don’t quote the King James Bible in my preaching. I usually use the New Revised Standard Bible, but this morning I want to read the first lesson from the King Jimmy: 6 As ye have therefore received Christ Jesus the Lord, so walk ye in him: 7 Rooted and built up in him, and stablished in the faith, as ye have been taught, abounding therein with thanksgiving. As ye have received Christ Jesus the Lord, so walk ye in him. Following Jesus, according to Paul, is about walking—walking with Jesus. Sometimes we walk with Jesus on the water, we walk with Jesus in impossible situations, into places we never thought we could go, but as we have received Christ Jesus he Lord, so we walk with him. Sometimes we walk with Jesus in the wind and the rain. We walk with Jesus through troubles and trials, we walk with Jesus when life is dark and threatening, we walk with Jesus, and it is all we can do to take the next step but as we have received Christ Jesus the Lord, so we walk with him. Sometimes we walk with Jesus and it is a happy walk, it is a leisurely stroll, through a Garden if you wish, we walk with him and we talk with him, and we he tells us we are his own. Sometimes we walk with Jesus and the sun is shining, and birds are singing and life is good. As we have receive Christ Jesus the Lord, so we walk in him. Sometimes we walk with Jesus through familiar territory, but sometimes we walk with Jesus through strange and distant lands. We walk with Jesus into places we cannot ever imagine entering by ourselves. We walk with Jesus in the highways and the byways of a scary and strange landscape among unfamiliar people with unfamiliar ways. We are thrust among people who are very different from us, but as we have received Christ Jesus the Lord, so we walk in him. Thomas A. Dorsey, 1932. Dorsey wrote this song in Chicago, Illinois, after his wife Nettie died while giving birth to a child (who also died shortly thereafter). Dorsey sang the song for his friend, Gospel singer Theodore Frye, and Frye’s choir sang it the next Sunday at the Ebenezer Baptist Church.